There are a variety of models that have been designed to help manage teams and plan projects. Two popular models utilized by managers and project leads are the Drexler/Sibbet Team Performance Model and the GRPI Project Planning Model. Both models present logical approaches to getting the most out of your work with a team. Often the goal of a leader is to gather the working parts of an organization, team, or project to form a cohesive unit and achieve a common goal. This chapter will characterize the stages of each model and explain how the two prescribed models can help optimize the workflow of a team effort. The Drexler/Sibbet model helps optimize the workflow of a team effort. Developed by Allan Drexler, David Sibbet, and Russ Forrester, this model comprises seven stages to help optimize the workflow of a team effort: orientation, trust building, goal clarification, commitment, implementation, high performance, and renewal. Each stage is identified by the primary question of concern for team members when they are in that phase. The structure of the model resembles the path of a bouncing ball. This is because the model demonstrates the team’s arch of energy. When in the stages toward the top of the diagram (the beginning and end), teams will often feel a greater sense of freedom – the orientation and renewal stages provide opportunities for limitless potential and possibility. 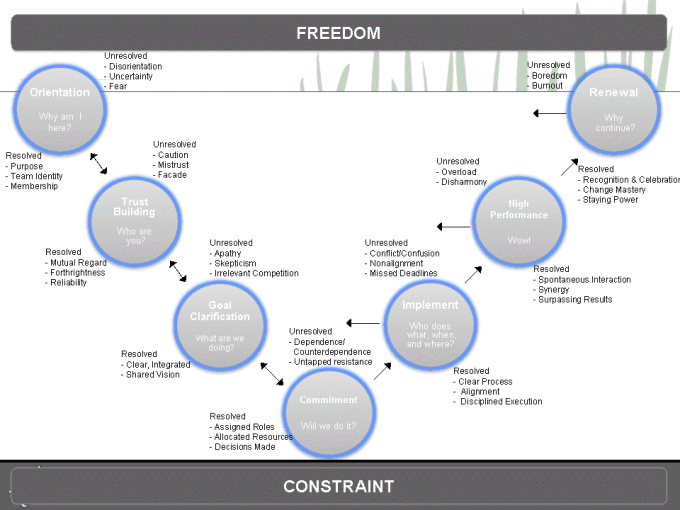 As a team moves into stages toward the bottom of the diagram (the middle stages), there are more constraints. Goals are set, and some things end up being included, while others do not. Teams don’t always move through the Drexler/Sibbet model in a linear fashion, so don’t be discouraged if you are unable to complete one stage before moving onto another. The model is designed to enhance workflow and team performance rather than restrict the team to a fixed set of rules. Let’s look more closely at each of the seven stages and the questions and issues raised during them. The primary question asked during this first stage of the model is, “Why are we here?” The team must work together to identify a task that each individual finds personally beneficial, useful, or important to the organization. When team members are unable to envision a role for themselves, they often feel anxious and distance themselves from the group. Alternatively, when members feel more connected, they are more likely to participate in achieving the group’s goals. According to the model creators, this is the stage during which “people want to know who they will work with – their expectations, agendas, and competencies.” Trust can only be established once team members become clear on their individual roles and responsibilities and establish a better understanding of each other’s work styles and experience. Here is where the team works to identify a shared vision by discussing possibilities, variations, and the reasons these goals may or may not be the best options. Some disagreement can happen during this stage, so it is important to make sure that everyone is on the same page before proceeding. This is also a good time to address any conflict between individual and organizational goals. This stage comprises the most constraining work the team will face during the entire process. If your work here remains unresolved, some team members may disown individual responsibility for the success of the team by going along with the preferences of others, while others may attack proposed courses of action without offering any feasible alternatives. Such behavior could indicate a lack of priorities, roles, or a clear definition of how work should proceed. The implementation stage is dominated by timing and scheduling. You may cycle back through earlier stages of the process as your team encounters unforeseen obstacles and works to find its groove. The key here is to impose some shared processes for completing the team’s work. This can be achieved with online project management tools, flowcharts, or work plans. While the design of this model might suggest that “high performance” is a destination that all teams reach, research indicates that many never do. But you don’t have to reach this point for good work to get done. The process outlined in the Drexler/Sibbet model is designed to increase the likelihood of becoming a high-performance team and spending more time in this stage. The primary question at this stage of the process is, “Why continue?” You can think of renewal as both an ending and a new beginning. Each team member may want to reflect on what worked and didn’t work, what was achieved and can now be left behind, and what issues remain to be tackled. The GRPI model is a simple but effective way to plan projects. Some teams may find it difficult to adapt the theory presented in the Drexler/Sibbet model into everyday practice. Another tool that may prove helpful in planning projects is GRPI – an acronym for goals, roles, process, and interpersonal relationships. Goals – What is the team going to accomplish? What is its core mission? Roles – Who will do what on the team? Are the roles and responsibilities clear? Process – How will the team work together to solve problems/make decisions? Interpersonal relationships – How do the team members get along? Periodically evaluating your team’s progress can help keep a project on track. Use this Team Status Check-in activity to periodically evaluate your team’s progress.